Crusaders midfielder Chris Morrow is expected to miss both of his club's Europa League matches in July after being injured in a pre-season game. 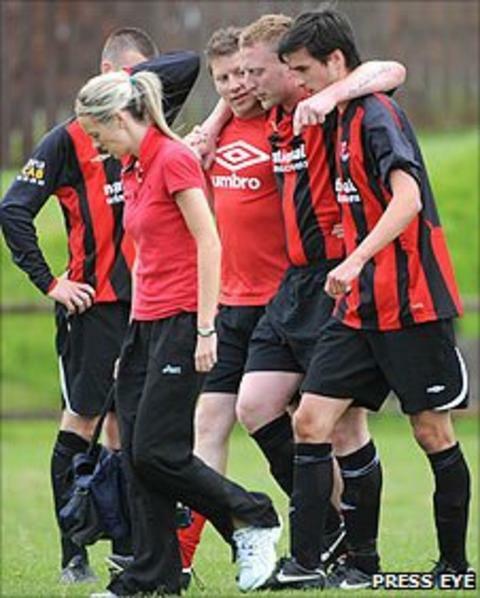 It had been feared that Morrow had broken an ankle in a 50-50 challenge during the Crues' 3-0 win over Larne. Defenders Colin Coates, Stephen McBride and new striker Timmy Adamson also picked up minor knocks. However, they should be fit for the European matches which will almost certainly be against Fulham. The English Premier side lead 3-0 after their home leg against NSI Runavik of the Faroe Islands. If Martin Jol's men confirm their place in the next stage, they will play at Crusaders' Seaview ground in Belfast on 14 July. Adamson, Michael Halliday and Ben Roy were on the scoresheet for the north Belfast club in the victory over Larne.